Wash and dry cherry tomatoes. Toss with 1 tbs olive oil and sprinkle with salt and pepper. Place tomatoes on a baking sheet and cook for 10 to 15 minutes or until they start to sizzle and ooze a bit. Remove from the oven and set aside. 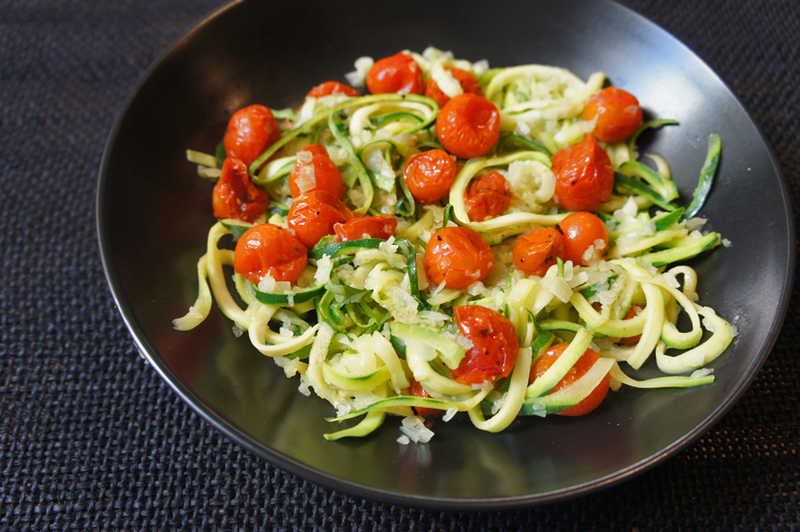 Wash and spiralize the zucchini into noodles with a spiralizing tool or buy the zucchini already as noodles. Heat a frying pan, add a tbs of olive oil. Once the oil is warm and evenly distributed on the pan add the onion and sauté for 3 minutes. Finally add the zucchini noodles to the onions and garlic and sauté for another 2-3 minutes. Remove from the stove and add the cherry tomatoes to the zucchini mixture. Sprinkle with shaved parmesan, salt and pepper and serve. Add white beans, sausage or shrimp to make it a more filling meal.